Kubernetes, the well known open source container management system, which has been widely adopted in the last years and has proven to be battle-hardened, is the de facto standard for deploying containerized applications. Thousands of companies are already using it in production and this is only the beginning. Besides solving a lot of problems, it also brings new ones on the board which are sometimes tedious. Nowadays, when complex microservice architectures with hundreds of services are deployed with Kubernetes, the configuration management of deployment files becomes a nightmare. The amount of different YAML-Files which need to be maintained are tremendous and often has it’s own dangers. Gaia is the perfect tool to automate Kubernetes deployments in a reproducible way, coordinate maintenance tasks for your cluster, cleanup of dangling resources in your cluster and much more. In this guide we will setup a small local test environment including Kubernetes and HashiCorp Vault which we will use to store safely our secrets. We will create a powerful Gaia pipeline in Go which deploys an application to this Kubernetes cluster (with namespace and service). We will also write tests for our pipeline which we can execute locally to test our jobs and make sure they are actually working. Develop powerful pipelines with the help of SDKs and simply check-in your code into a git repository. Gaia automatically clones your code repository, compiles your code to a binary and executes it on-demand. All results are streamed back and formatted to a user-friendly graphical output. Kubernetes master is running at https://localhost:6443 KubeDNS is running at https://localhost:6443/api/v1/namespaces/kube-system/services/kube-dns:dns/proxy To further debug and diagnose cluster problems, use 'kubectl cluster-info dump'. The first step is to download and start HashiCorp Vault as well as Gaia and join them into the same docker network. This will create a network called gaia-vault which is used to allow communication between Gaia and HashiCorp Vault. Then we start HashiCorp Vault with a development token (Don’t do this in production!). We expose the service on port 8200 which is optional and can be omitted if prefered. The last command starts Gaia and exposes it on port 8080. For this tutorial we don’t mount the data directory to the host system. This means if you delete your Gaia Docker container all your data is lost. If you want to persist your data you can mount the data folder via the following parameter: -v $PWD:/data. The Kube-Config is particularly important for the connection to the Kubernetes API. It tells the Kube-Client (usually kubectl) where the API is located and a certificate for authentication and authorization purpose. If you use the local Kubernetes cluster from Docker for Mac or Docker for Windows the Kube-Config should be already generated and placed on your file system (usually ~/.kube/config). Our Gaia pipeline should have later access to the Kubernetes API and therefore needs access to this Kube-Config file. The perfect place for this sensitive file is HashiCorp Vault where we will store it now. Let’s assume that HashiCorp Vault is not locally installed. If you have HashiCorp Vault locally installed and did set VAULT_ADDR and VAULT_TOKEN correctly you can skip the next step. We encoded our config in Base64 so there are no problems with special characters. GetSecretsFromVault sets up the connection to Vault and gets our stored Kube-Config. PrepareDeployment sets up the connection to our Kubernetes cluster and parses all given paramets by Gaia and stores them in-memory. CreateNamespace sets up a new namespace in our Kubernetes cluster. CreateDeployment creates a Kubernetes deployment resource. It will update the resource if already exists. CreateService creates a Kubernetes service resource. It will update the resource if already exists. main is our main entry function which registers all functions and builds the dependency graph that tells Gaia in which order the functions should be executed. It also starts the Serve method which is provided by the Gaia Go-SDK. Gaia really shines when it comes to testing your developed pipelines. The pipeline we have developed is pure Go code so we can test it like usual. 2018/07/13 23:28:40 All data has been retrieved from vault! 2018/07/13 23:28:40 Service 'nginx' has been created! 2018/07/13 23:28:40 Deployment 'nginx' has been created! You should now see the Gaia login view. Use the default credentials admin/admin to get access. Now we will add our pipeline to Gaia by clicking on the top button “Create Pipeline”. This will forward us to the create pipeline view where we copy the URL of our pipeline (https://github.com/gaia-pipeline/tutorial-k8s-deployment-go) into the first input field. We should give this pipeline a name to distinguish this one from others. Afterwards we click on “Create Pipeline” below. Gaia will now automatically checkout our pipeline code, build it into a binary file, copy the binary file into the local pipelines folder and finally do some sanity checks. You can view the status of this process below in the pipeline creation history table. Gaia comes with it’s own internal Vault which can store secrets and sensitive data in a secure way. In our scenario it makes sense to store the address of our HashiCorp Vault instance as well as the access token which is needed so that our pipeline gets access to Vault. Please keep in mind that this is just an example. In a real scenario it might be better to use different authentication methods to authenticate against HashiCorp Vault. Finally, we can go back to the Overview and should now see our pipeline. 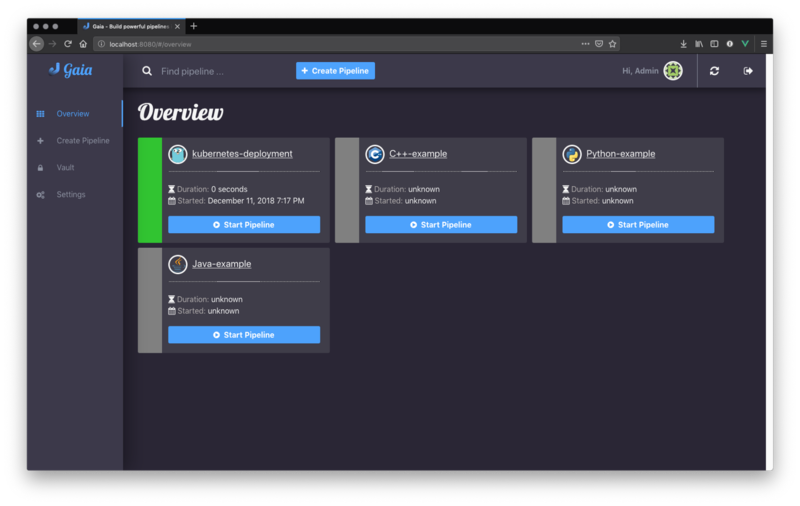 Click on Start Pipeline to start the pipeline. This should forward you to the arguments view where you have to specify the application name (e.g. myapp), full image name (e.g. nginx:latest), and the number of replicas (e.g. 1). After the pipeline has been scheduled, you should see very quickly progress in the detailed view of your pipeline run. We setup a local test environment with Kubernetes, HashiCorp Vault and Gaia. We saved sensitive data (Kube-Config) in our HashiCorp Vault instance. We build a powerful pipeline in Go and wrote tests for it. We created a new pipeline in Gaia. Gaia automatically compiled our pipeline. We added secrets to Gaia’s Vault and executed the pipeline. With just a few steps we created a powerful pipeline which is secure, tested, includes no hidden magic (at the end it’s just Go code), fast, and the most important part: It was fun!